O/o Deputy Director, Town & Country Planning, Dhubri. 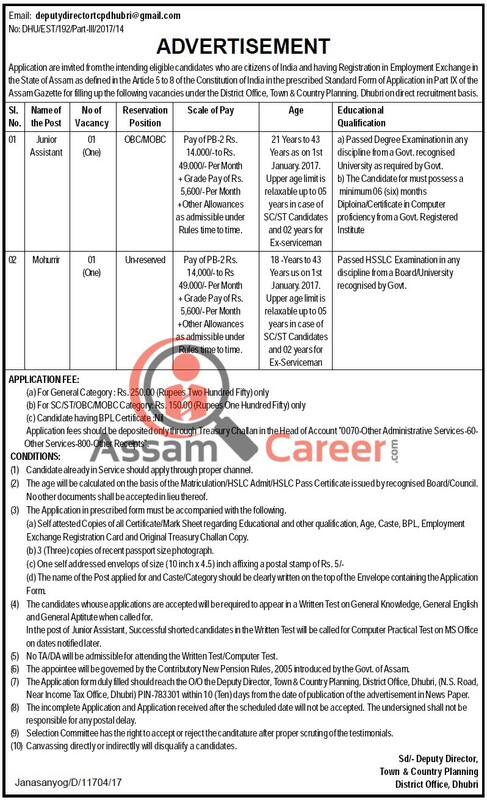 Application are invited from the intending eligible candidates who are citizens of India and having Registration in Employment Exchange in the State of Assam as defined in the Article 5 to 8 of the Constitution of India in the prescribed Standard Form of Application in Part IX of the Assam Gazette for filling up the following vacancies under the District Office, Town & Country Planning. Dhubri on direct recruitment basis. Educational Qualification: Passed Degree examination from a Govt. recognised university and must possess a minimum 6 months Diploma/ Certificate in Computer Proficiency from Govt. registered institute. Educational Qualification: Passed HSSLC Examination from a board / university recognised by Govt. Application fees should be deposited only through Treasury Chalan in the Head of Account "0070-Other Administrative Services-60-Other Services-800-Other Receipts". Selection Process: The candidates whose applications are accepted will be required to appear in a Written Test on General Knowledge, General English and General Aptitude when called for. In the post of Junior Assistant, Successful shorted candidates in the Written Test will be called for Computer Practical Test on MS Office on dates notified later. (a) Self attested Copies of all Certificate/Mark Sheet regarding Educational and other qualification, Age, Caste, BPL, Employment Exchange Registration Card and Original Treasury Challan Copy. (b) 3 (Three) copes of recent passport size photograph. The Application form duly filled should reach the O/o the Deputy Director, Town & Country Planning, District Office, Dhubri, (N.S. Road, Near Income Tax Office, Dhubri) PIN-783301 within 10 (Ten) days from the date of publication of the advertisement in News Paper.